Well, here’s one way to learn about a cat’s anatomy. Apparently as part of a lesson plan for an anatomy class at Winston Churchill High School in San Antonio, students were seen dissecting cats and then using their intestines as a jump rope. There are two videos which break it all down. The first video shows kids dissecting cats while someone jumps rope with a cat’s intestine. 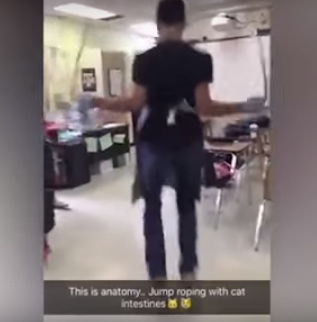 The second video shows two students swinging a cat’s intestine while a third jumps over it like a jump rope. But it isn’t a jump rope. It’s a cat’s intestine. Yay public school in America. Really? How do you think the cat feels? “Best practices change over time”??? It’s 2016, and kids in Texas are using cat intestines as a jump rope to learn about the tensile strength of cat organs because… why exactly is that again? Where does the tensile strength of cat organs really come up in life? That the public education system is about indoctrination and dumbing people down isn’t really in dispute. But you know the elite are laughing at this stuff… You think elite children are ever made to jump rope with cat intestines in school? For more on this, don’t forget to read The Deliberate Dumbing Down of America. Contributed by Piper McGowin of The Daily Sheeple. Piper writes for The Daily Sheeple. There’s a lot of B.S. out there. Someone has to write about it.